Suppose that your company has two independent Internet connections: the first used as main link and the second used ONLY in case of main connection fault. What can we do to avoid a ‘manual’ switch of routing and NAT tables? In general, in this case, the best solution is to use the BGP protocol with bofh providers, but this solution can be very expensive, so are there other ways to implement this process? Cisco IOS IP SLAs allows you to montior, analyze and verify IP service levels for IP applications and services, to increase productivity, to lower operational costs, and to reduce occurances of network congestion or outages. IP SLAs uses active traffic monitoring for measuring network performance. Cisco Policy Based Routing provides a flexible mechanism for network administrators to customize the operation of the routing table and the flow of traffic within their networks. 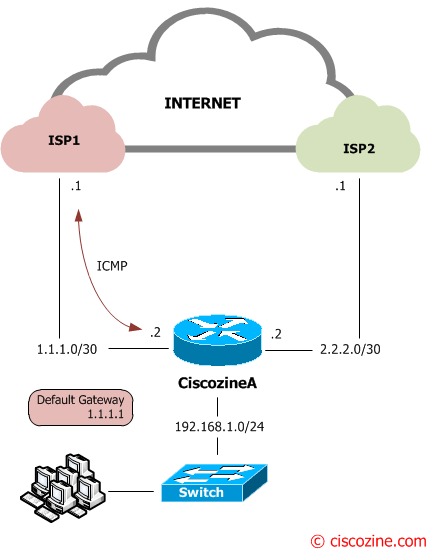 Cisco Policy Based Routing offers many advanced features, including selection and forwarding of traffic to discreet Virtual Routing and Forwarding (VRF) instances, as well as Enhanced Tracking of the availability of next-hops. Cisco IOS Embedded Event Manager (EEM) is a flexible subsystem that provides real-time network event detection and onboard automation. It gives you the ability to adapt the behavior of your network devices to align with your business needs. 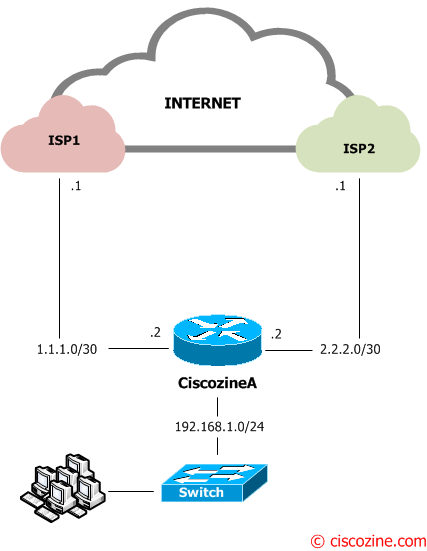 Suppose that your company has two independent internet connections (ISP1 and ISP2) connected to the Ciscozine router by two point-to-point connection (1.1.1.0/30 and 2.2.2.0/30). The ISP1 is the main connection, while the ISP2 is the backup connection. 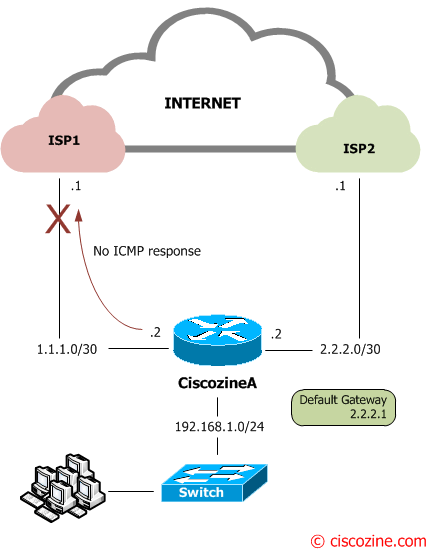 If the ISP1 has some troubles and the Ciscozine router does not receive the ICMP reply, the Ciscozine router will change the default route (from 1.1.1.1 to 2.2.2.1) and it will apply a new nat translation. Note: The number “10” define the SLA object number; it will be used in the next step. Note: In some case, it can be better track a public ip address, for instance 8.8.8.8 (Google public DNS server), instead of the default gateway (1.1.1.1). Note: The default gateway is 1.1.1.1 because it has a better administrative distance (the default administrative distance for static route is 1) than the 2.2.2.1 gateway (it has administrative distance “2”). As you can see, the first route “ip route 0.0.0.0 0.0.0.0 1.1.1.1 track 1” has the track feature enabled, linked to the SLA object; when the #10 SLA object goes down, the route is deleted from the routing table, so the second route “ip route 0.0.0.0 0.0.0.0 2.2.2.1 2” will be installed in the routing table. Obviously when the ISP1 connection goes up, the first route will be installed again and the second route deleted. Note: With this configuration, the PAT is applied when a packet with source 192.168.1.x exits to the fastethernet0/0. This happens when the default gateway is 1.1.1.1 (ISP1). Note: With this configuration, the PAT is applied when a packet with source 192.168.1.x exits to the fastethernet0/1. This happens when the default gateway is 2.2.2.1 (ISP2). At the end, it is recommended, but not mandatory, it is possible use EEM script to clear automatically the NAT translation when the default route changes. action 1.5 cli command "clear ip nat trans *"
action 2.0 syslog priority notifications msg "Nat translation cleared!" The “enable” and the “clear ip nat trans *” commands to flush the nat table. A syslog message with the text “Nat translation cleared!”. Remember: When The Port Translation (Overload) is enabled, non-DNS UDP translations time out after 5 minutes, DNS times out in 1 minute, while TCP translations time out after 24 hours, unless a RST or FIN is seen on the stream, in which case it times out in 1 minute. When the main connection goes down (Figure3), three things occurs. 1. Two logging messages will be generated: one defined by the IOS and one defined “manually” with EEM feature. Nov 22 22:52:51.663: %HA_EM-5-LOG: check-isp: Nat translation cleared! Nov 22 22:53:16.667: %HA_EM-5-LOG: check-isp: Nat translation cleared! A good alternative to use two independent internet connections in active/standby mode without using BGP protocol. IP SLA, PBR and EEM are the actors of this article.